ManageWP has long been a leader in the small group of businesses that want to help you manage your WordPress installs from one place. The six year old service has gone through a long development phase, where they rebuilt everything from scratch. It is now live for all customers, with a “legacy” option for folks that aren’t ready for the switch. I’ve experimented with ManageWP’s new interface in a couple of sessions, and overall it’s a very impressive app. If you are looking for a central hub to maintain a large number of websites, it is a useful tool. The interface is well designed and the team has done a thorough job building out a highly functional app. Also, the onboarding experience is quite good. MangeWP is marketing the service as free to start, which is true, but it’s a pretty limited scope of features for the free version (at least compared to all that they offer for the paid version), and pricing for the paid components can be tricky to figure out. A team of, “nearly thirty people,” it’s evident that ManageWP is gearing this launch first to existing customers, seeking to re-sell the features and new interface to what I presume is a pretty loyal base of customers. It’s hard to change your workflows that you’ve used for a long time, and the carefulness of the launch is evident, from pricing explanations to keeping the legacy format. Pricing on ManageWP has long been complicated. Previously, three tiered plans (standard, professional, and business) would be discounted based on how many sites were under management. The “standard” plan, which used to start at $1.50 per website, and went to $0.40 per website with 100 sites, is now the free plan. The all-in “business” plan started at $9.00 per website and went down to $2.40 per site for 100 websites. For ManageWP, I think this is a pretty smart move, if a bit cumbersome for customers to figure out. For folks just managing a few sites, the new plan is cheaper. And while there is a significant range of customers that may pay more, that’s only if they use every feature. The bundles are a per-feature price, so if someone manages 500 sites but only uses the backup and SEO features, they could end up saving money. And with the new pricing, they know exactly what they’re paying for. However, the new pricing is so complex, I’m not sure if it’ll play well with currently loyal customers trying to navigate the waters. 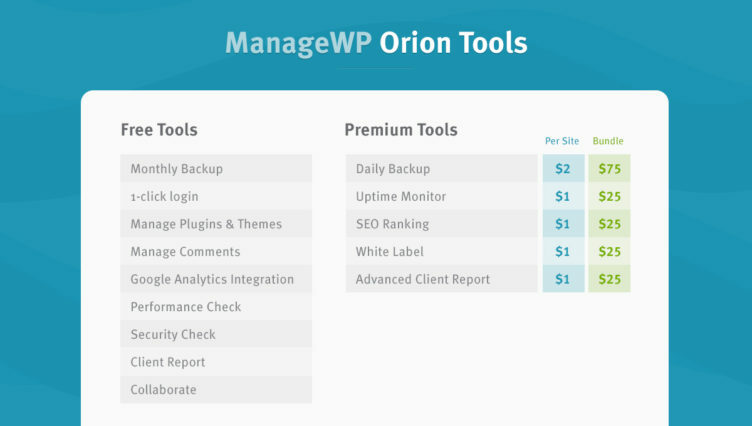 If you compare this pricing to VaultPress — which is probably considered the most reliable backup source in the WordPress world — it’s significantly cheaper. Daily backups for VaultPress start at $9, and “realtime” backups (which also include other features, to be fair) are $29 per site per month. The most prolific of the “similar WordPress tools” Vladimir is referencing is likely BackupBuddy by iThemes. BackupBuddy and other traditional WordPress backup solutions have long had to fight unpredictable WordPress hosting environments. 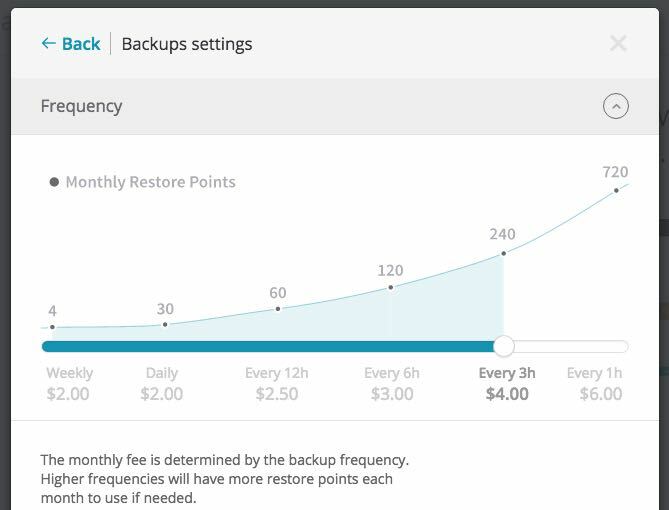 iThemes, like VaultPress before them and ManageWP now, also saw the value of bypassing the hosting limitations, and in February launched BackupBuddy Stash Live for real-time backups. So the market is maturing, thanks to competition, and I presume a rising awareness to the importance of not only backups, but recent and reliable ones. Time will tell how the new pricing plays out. I know that the ManageWP team is paying close attention to adoption of the new application and pricing, and will likely adjust accordingly. 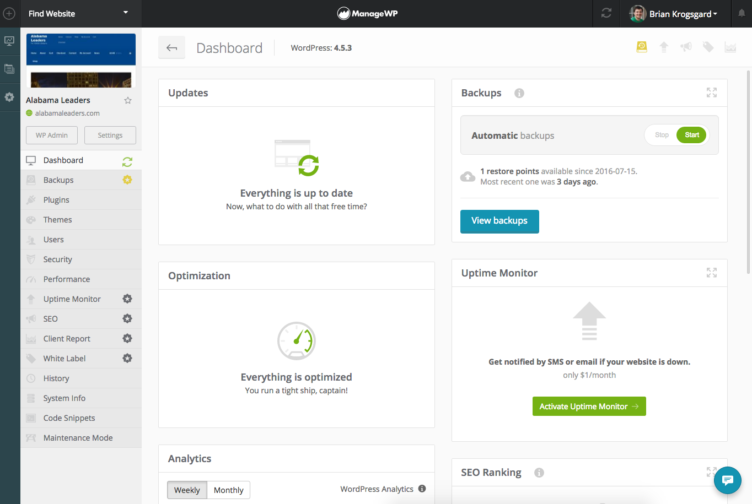 Long pricing and backups tangent aside, ManageWP’s history and resilience is a very impressive story in the WordPress ecosystem. This re-launch of their product took a ton of work and I think they’ve done a nice job with the rollout as well as the app itself. I look forward, down the road a bit, to see how it all goes for them, as I think their experience could help other product and SaaS businesses learn as well.